"This is one that was recited to me out of memory alone, and described as a hand of garlic, etc., though the ingredient quantities should be accurate. I encourage buying the cheapest versions of these ingredients you can find; it will feed an army for about $15 without ruining the taste. You should add more seasonings based on preference. 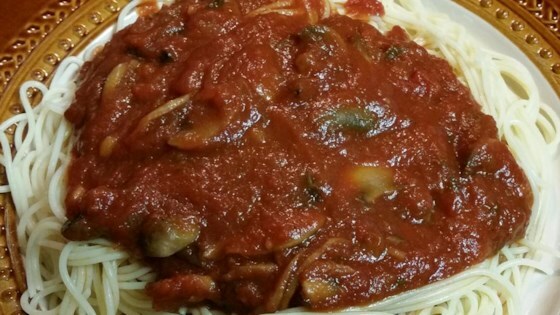 A great vegetarian sauce, and with meatballs...it makes great meatball sandwiches." Heat olive oil in a large saucepan over medium-low heat, and cook and stir the onion and garlic until translucent but not browned, 6 to 7 minutes. Stir in the mushrooms and basil, and cook and stir until the basil is wilted and the mushrooms are cooked through and have given up their juices, about 10 minutes. Pour in the whole peeled tomatoes, and bring the mixture to a boil, stirring and chopping the tomatoes into pieces with a spoon. Pour in the tomato sauce and stir, crushing any large pieces of tomato left, and bring to a simmer. Let the sauce simmer until slightly thickened and bubbling, stirring occasionally, about 15 minutes. Stir the tomato paste into the sauce, and fill the empty tomato paste can with Merlot wine, stirring to dissolve any remaining tomato paste in the can. Pour the Merlot wine into the sauce, and stir well to combine. Bring the sauce back to a simmer, and stir in the salt, pepper, dried oregano, and sugar. Let the sauce simmer until the seasonings are blended and the sauce is heated through, about 3 more minutes. See how to make a super-simple spaghetti sauce. It's ready in less than an hour. Fantastico...Molto grazia. This was amazing and so easy. Great, I will make this time and time again. I would change nothing.